June 30, 2016, 3:58 p.m. Since Jeremy Corbyn&apos;s victory last September YouGov research has consistently shown that Labour party members have stuck by their leader. In fact, it has been conventional wisdom in Westminster that Corbyn&apos;s support amongst the Labour membership is rock solid. However our most recent poll for the Times, carried out entirely after the Brexit vote last Thursday, shows that opinions are shifting fast - his net job approval is reduced to +3, down from +45 just last month. This week has seen a string of resignations from the Shadow Cabinet with many MPs, including former leader Ed Miliband, calling for Corbyn to resign. These divisions are also apparent within the party membership. Amongst those who voted for an “Anyone but Corbyn” candidate last year (Yvette Cooper, Andy Burnham or Liz Kendall) eight in ten think he should step down as leader straight away. 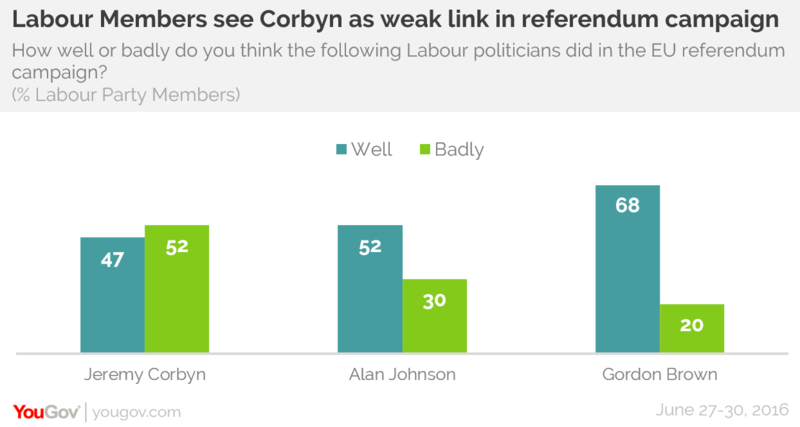 Amongst the 59% who supported Mr. Corbyn, six in ten think he should stay on and fight the next general election. One reason for this could be suggestions of a “lacklustre” referendum campaign in which Corbyn wasn’t as visible as many would have liked. 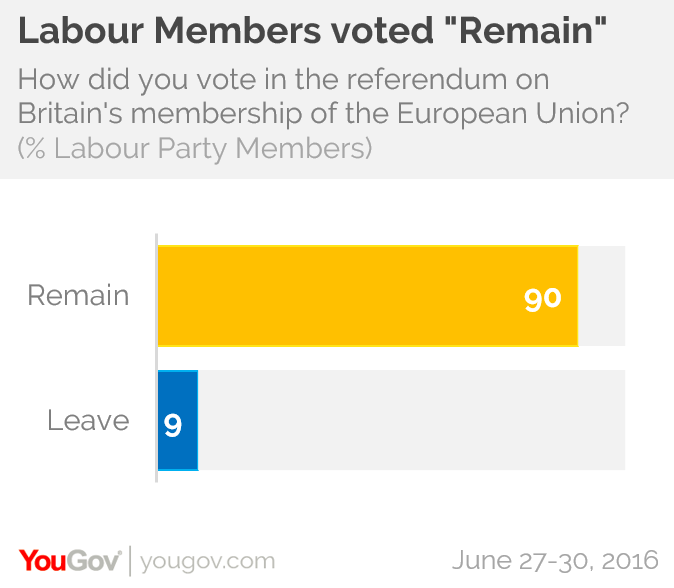 The membership is overwhelmingly supportive of the EU with 90% voting Remain last week. Over half (52%) of Labour party members think Mr. Corbyn performed badly during the referendum campaign with 47% thinking he performed well. On the other hand members think past leader, Gordon Brown, had a much better campaign with 68% thinking he did well and just 20% thinking he did badly. What this points to is that any candidate wishing to challenge Mr. Corbyn would be well advised to make the argument based less on Labour&apos;s internecine faction-fighting and more on the country&apos;s future after Brexit and their concern with Mr. Corbyn&apos;s performance during the referendum. There has been much speculation over who might challenge Mr. Corbyn, with Angela Eagle and Owen Smith rumoured to be considering a leadership bid. 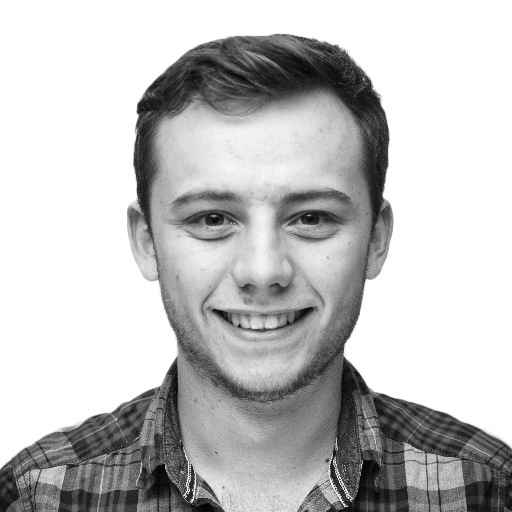 As things currently stand, were Mr. Corbyn was on the ballot paper again, 36% say they would definitely vote for him (down from 50% in May) and 36% say they definitely wouldn’t vote for him (up from 22%). In a hypothetical head-to-head matchup between him and Angela Eagle, he currently holds a 10 point lead at 50% to 40%, with 5% saying they would not vote and 7% saying they don’t know. 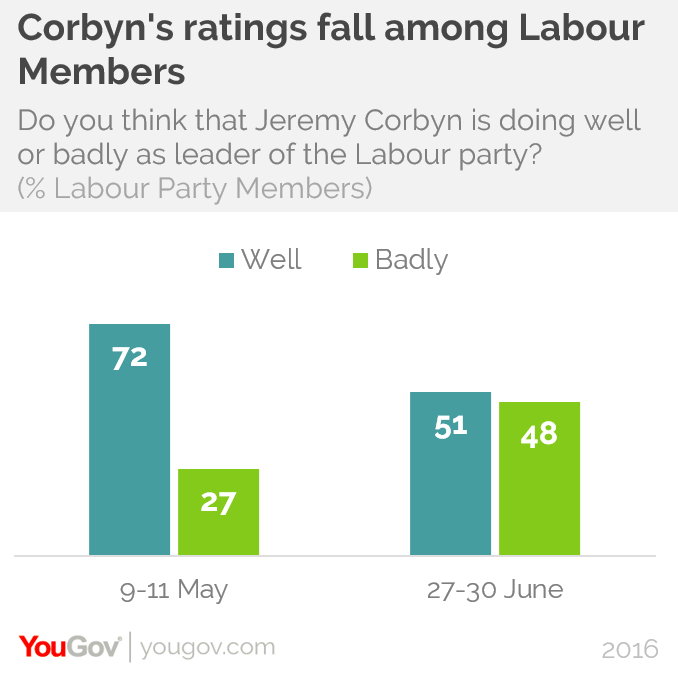 In other head-to-heads Corbyn does better, currently ahead of Tom Watson by 11 points and Dan Jarvis by 17 points. The poll is solely made up of full party members. Like last year, it is possible for any member of the public to get a vote in a leadership election if they pay a £3 fee. Members of affiliated trade unions can also opt in to voting. The methodology is the same as we used to accurately predict Corbyn’s victory last year.